Two doors down from De La Vega and across the street from an East Village bookstore is a round, white cartoon figure that bears striking resemblance to a cuddly, tuxedo-less penguin. 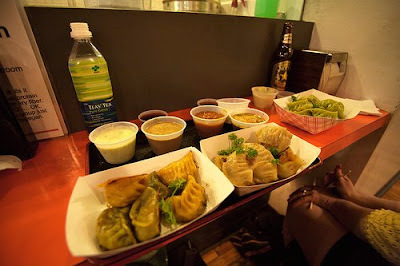 Welcome to the Dumpling Man, a casual dumpling bar that serves a focused selection of the northern Asian delight. Founded by Taiwanese entrepreneur Lucas Lin, Dumpling Man’s commitment to its graphic identity sets it apart from other dumpling establishments. While waiting to order, customers can peruse the ample apparel selection, which ranges from t-shirts and baby wear to a hot pink thong. Just $6.50 gets you ten dumplings filled with juicy pork or chicken and a front-row seat to the centuries-old tradition of wrapping dumplings. The dumplings, which come seared or steamed, are a generous mouthful of meat, herbs, and spices. Don’t miss out on their weekly “Surprise Dumpling,” which can contain anything from fiery Korean kimchee to delicately crisp fresh water chestnuts. To long-time dumpling fans, a second surprise arrives as the “Sweet Dumpling,” a fusion-style dumpling stuffed with pumpkin pie filling. Although Dumpling Man sits on the (barely) pricier end of the dumpling bar spectrum, its innovative fillings and colorful decor keep the regulars coming back for more.